For a bit of modern style in your bathroom, choose this beautiful vanity. This piece comes with a beautiful black mdf base and a white artificial stone counter. There's plenty of space for items in this vanity's drawers and single-door cabinet. This simple vanity set from Bosconi will fit right into any bathroom decor. Enjoy the popular modern look in your bathroom with this beautiful vanity. Its white acrylic counter and black mdf base will look beautiful in your home. This simple vanity set from Fresca will fit right into any bathroom decor. 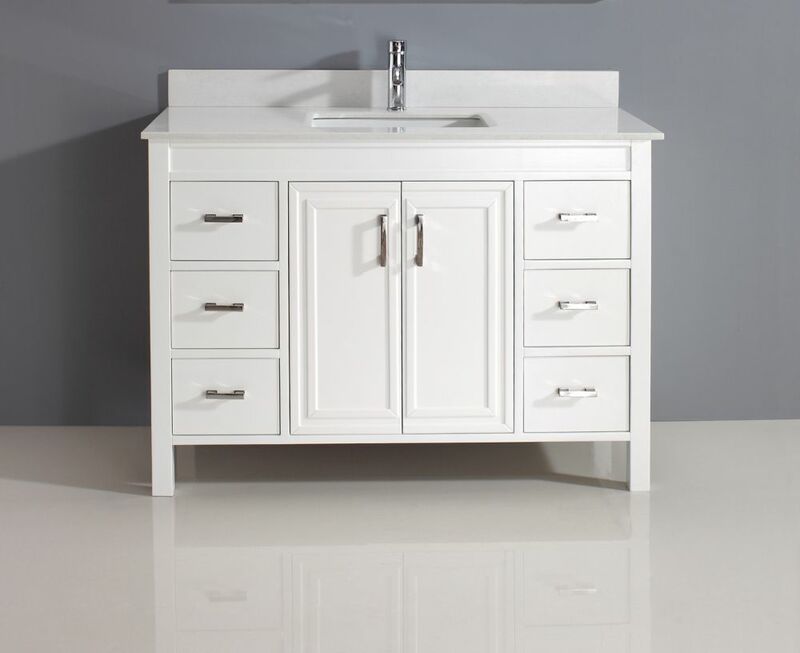 Corniche 48-inch W 6-Drawer 2-Door Vanity in White With Artificial Stone Top in Off-White Designed with a modern style and strong build, this vanity is a perfect choice for any bathroom. Its off-white artificial stone counter and white solid wood base are very easy on the eyes. Made with a roomy double-door cabinet and drawers, this vanity has lots of room to keep items like toothpaste, towels, and hair brushes. Put a nice twist on your bathroom project with this classic piece from Art Bathe. Corniche 48-inch W 6-Drawer 2-Door Vanity in White With Artificial Stone Top in Off-White is rated 5.0 out of 5 by 1. Rated 5 out of 5 by Cathy from Like it! Very happy with the weight and quality of the unit, and the countertop. It's a nice addition to our new guest bath. Nice to have the drawers, but leaves less space than i realized in the center cupboard. Counter is almost white, with little pattern - exactly what i wanted! #1000789772 Specification mention 42-inch W but the item is described as 48 inches. Which is it? How big is the sink? How long and wide?